You probably know the Taiwanese-born style director of soon-to-close Details magazine from every fashion week gallery ever. A menswear veteran, Tong has been an ever-present in the viewfinder of street style tastemakers like Tommy Ton and George Elder for years, usually snapped oozing understated cool that cuts through the try-hard din fashion weeks tend to foster. His Instagram, you’ll be happy to learn, is more of the same. Tong’s looks tend to be pared-back and a little more ‘grown up’ than most of the others on this list. Heeding the title of the mag where he served for five years, his focus is firmly fixed on the little things: trainers with gum soles, watches, impeccable outerwear. Plus his penchant for relaxed trouser fits is a move we’d all do well to steal. Naturally, he’s also got the fashion month game on lock, bringing us front row action from showings by modern labels like N. Hoolywood and Public School NYC (a brand Tong styles for) – you know, the kind of access that schmoes like us daydream of. Why follow? Come for the name, stay for the details. Tong has an eye for subtle accessories and shows that old axiom ‘less is more’ still rings true today. His feed’s a joy of candid photography of kids taking classic skater style and mixing it with whatever vintage finds they can get their hands on. Shot in film and transported to the ‘gram, the colours are bold and the outfits are real: washed-out denim, hoodies, Gosha, Palace, Supreme, and Pigalle form the building blocks, while broken wrists, classic looks and sporty cuts are mixed with touches of 1970s chic. It’s tough seeing kids with taste this good. Being sartorially (and professionally) bested by a teenager still at secondary school might be a new low. Why follow? It’s a peek at how the next generation are rocking luxe streetwear, and how you can too (provided you’re still in your twenties). Our key takeaway: bleached-out denim is back. The undisputed god of sneaker collabs, scourge of streetwear resellers, and founder of renowned New York store KITH, Ronnie Fieg also aces Instagram. Prolific in his posting, Fieg’s feed contains a wealth of exclusive gear and teases of upcoming collaborations, such as KITH’s latest revival of mountain wear, the limited run of 1980s Arctic clobber by Colombia Sportswear Company, and the network he taps to make his ideas really pop – not everyone gets to have rap royalty like Joey Bada$$ modelling for the ‘gram. Yet Ronnie knows it’s him that’s the real star of the show, never skipping an opportunity to showcase himself working, and the most comfortable uniform to do it in: slim joggers, no-fuss sweatshirts, a well-cut hoody and – of course – the obligatory x Fieg trainers. Why follow? Big Ronnie Fieg’s the north star when it comes to working tracksuits into your daily attire and gives you a sneak peak into what it’s like to have the most sought-after eye in sneakers. One of the key faces behind The Basement – shadowy streetwear cabal or friendly, Supreme-loving, Facebook community (depending on who you ask) – dedicated2idiocy (real name Paolo Cimarra) is certified. His patented #basementapproved hashtag has taken on new levels of legitimacy in the dog-eat-less-well-dressed-dog climate – and if Ded’ and the gang says it’s cool, then it’s cool. As you’d expect from a kind of Henri Cartier-Bresson of taking photos of kids camping outside Soho’s Supreme store for the latest limited edition drop, Cimarra’s feed is one-part mixture of #basementapproved outfits and items, collabs and sneak peaks, and two parts anthropological study of London’s sneakerhead generation. The kids are practical (North Face, beanies) and cool (Supreme collabs, expensive military-inspired Tenderloin kit) and their #OOTDs are sound fodder if you’re running low on off-duty inspiration. Why follow? It’s unprecedented access into the insular community of London Supreme heads and also proof that there’s no such thing as ‘too garish’ a print if it’s on a black puffer jacket. Never without a smoke and blessed with an instantly iconic shock of hair, Sabbat has – despite being pretty much known unknown last year – caught the eye of streetwear majors like Stüssy and Hood By Air, as well as racked up features in magazines like Vogue. But it was the kinship forged with Off-White honcho Virgil Abloh that took him to the next level of Instagram’s most stylish; it was Abloh who recommended Sabbat to Kanye West when it came time to casting the rapper’s Yeezy Season 1 show. Unlike some, he’s an equally big deal online as well as in real life. He’s become one of the most sought-after models in the game, and has gained over 100,000 followers on Instagram (to go with the 50,000 followers he has on Twitter). His style combines his signature 2k15 Jimi Hendrix look with an eye for classic sportswear like jet black, tailored tracksuits with the Tippex-white Dreistriefen of German giants adidas. Why follow? He’s literally living your dream, right now. In fact, he’s living all our dreams: just turned 18 and he’s a style rockstar with the world at his feet and a size 28″ waist. The Walthamstow-based curators of UK garage menswear have gained a lot of traction in a short space of time. Coupling the resurgence of terrace wear – i.e. the gear style-conscious lads who’d get rowdy at the football were likely to have on 15 years ago – and a generation who’re looking to London’s more recent past for inspiration, Too Hot have cornered the market for throwback casual streetwear. 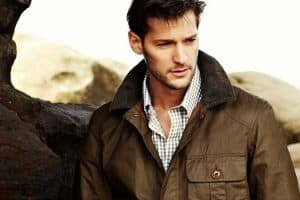 Their sizing is charmingly wayward, but the product on offer is consistently sharp: Burberry check, Lacoste sweats, Patagonia fleeces and classic The North Face jackets sit side-by-side with iconic, rare items that often stem from the late Italian menswear maestro Massimo Osti: Stone Island, C.P. Company and Left Hand. The editorial content is brash and original, too: staff photographer Bafic’s visuals lend surrealist elements to north London council estate lookbooks and the shots are vivid and warm even in high-contrast black and white. Why follow? They claim to deal in “iconic cultural artefacts”, and they’re not wrong. Their eye for construction and quality is unmatched, and their feed offers a valuable look into an underrated era of fashion. Their ethos – that looking backwards is always a valuable building block for forward movement – is one worth taking on board. Clarke says he doesn’t know how he became the MVP of the next generation of skateboarders, but we can hazard a guess. Skateboarding is a sport whose defining characteristics go way beyond grinds and jumps and crackly Thrasher ‘tapes, and Clarke embodies what’s new better than anyone else. He just signed a lucrative signature sneaker deal with Supra and, along with his mates at PWBC (the Palace Wayward Boys Choir), he’s influencing the way kids of all ethnicities are dressing. Skateboarding’s influence on streetwear culture now almost totally outstrips the traditional pull of hip-hop – something that would’ve seemed unthinkable 20, even 10, years ago. And Clarke’s at the forefront of that movement. Which is proof that gawky white dudes like Tony Hawk no longer rule the scene. Along with the obligatory Palace hook-ups – the ‘P’ in his crew – there’s big, bold graphics, hooded clobber in neutral palettes, and relaxed shapes. The graphics are this feed’s standout feature, taking the bolshy iconography of skate photography and vinyl stickers and transferring them to jumpers and outerwear. Why follow? Clarke’s status as skating’s golden boy is solid and his revolving door of famous buddies (like 2015 MVP Skepta) is also worth turning that button green. If there’s one lesson to learn, here it is, in the skater’s own words: “be yah self, always have fun with it and keep it gangster”. Which of streetwear’s finest do you find yourself double-tapping? Are there any other feeds we should be following?